Two words come to mind when I think of my first-ever trip to Ann Arbor's University of Michigan: Huge and Beautiful. I had kind of expected Huge. I knew before I got there how big its student body is (about 42,000, of which about 27,000 are undergraduates). I learned how many fans its football stadium holds (nearly 110,000--about 20,000 more than the Rose Bowl in Pasadena). I read how the university grew up and around the town of Ann Arbor, swallowing it until it became, in essence, part of the campus. But the Beautiful: That was a surprise. Big, mature trees everywhere. Gorgeous old buildings (the current campus location dates back to 1837), and even gorgeous new buildings made to look like old ones. Sometimes I felt like I was in Cambridge, England--the feeling was that lovely, established, and leafy. One of the 37 bajillion leafy, mature trees that make this campus so beautiful. This is the Kinesiology building, right up the street from where The Boy's dorm. Look at that Tudor wonderfulness! *Sigh. * I'd buy my pens and pencils one at a time, just so I could go through those doors more often. Which brings me to the other hallmark of UofM: Its size. U-M covers more than 700 acres. It's so big, students often take an inter-campus bus to get from one class to another. The campus is by far larger than the town of Ann Arbor, which itself has a population of nearly 114,000. That's bigger than Santa Barbara. The official seating capacity of The Big House is a hair under 110,000. That's a lot of fans! Of course, a lot of things about the UofM are just like anywhere else. They have sororities and fraternities, a spot that's constantly covered in spray-painted graffiti, and plenty of things to buy that feature the maize-and-blue "M" on them. It just seems like...there's more of everything there than I've ever seen anywhere. This is the official boulder where graffiti happens. It's in the middle of a roundabout, and in two days it was repainted four times! Somebody in Ann Arbor is making a killing, selling spray paint to college kids. Repainted four times in two days. At that rate, over the lifetime of the college, I calculate that the original boulder underneath the 22 gazillion coats of paint is the size of a bowling ball. Cute, English-countryside charm. Love the roof pattern. It's blue. It has a bike. It has a porch: Of COURSE I love this house! So many trees! And even the lamp posts are more appealing here than where I live. Green, green, green, and a patch of blue-and-white sky. To a gal from semi-arid Los Angeles, all this green is nothing short of a miracle. My favorite shop was a terrific store called Downtown Home and Garden, an Ann Arbor institution for more than 100 years. 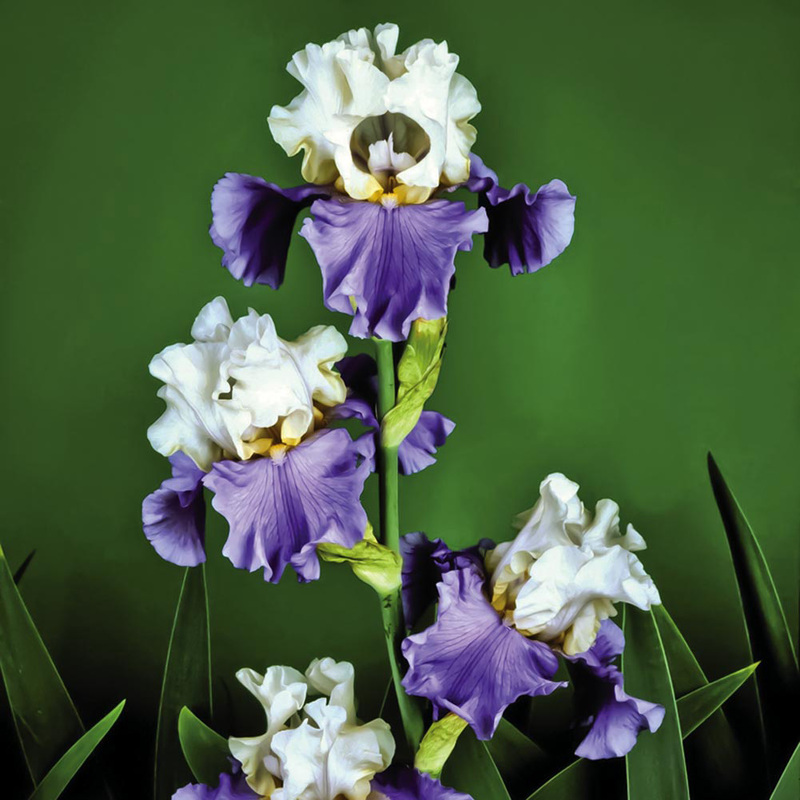 It evolved decades ago from a feed store into a marvelous assembly of all things unusual and lovely for, well, home and garden. Smile, Lewis! You're back home now. ...and a whole mess of these. They are rhizomes of Bearded (a.k.a. 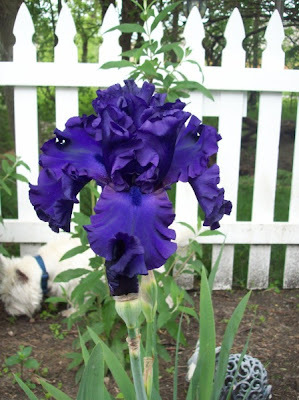 German) Iris. I first met Erika through this blog you are reading now. She was the very first person to put Teapots and Polkadots as a "Like" on her own blog, so naturally I had to take a look at hers. 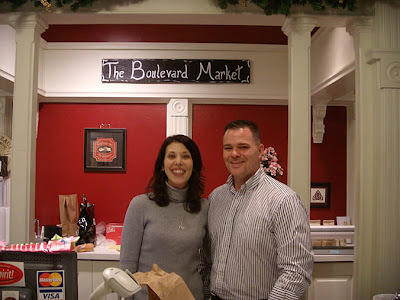 I learned that Erika and her hubby run a terrific specialty-food emporium, The Boulevard Market, outside Ann Arbor in the sweet little town of Tecumseh. In addition to running the gorgeous shop, Erika teaches monthly cooking classes, and John makes their own fantastic cheeses (Four Corners Creamery) and creates his own chocolates. On Erika's blog, I learned about their three lovely daughters, their cute dog Pierre, and their fondness for good wine and food. We hit it off in cyberspace. Then, when The Boy chose to go to UofM, I knew I just had to meet Erika, John, and Pierre the puppy. So we made arrangements. We met, we yakked, we dined, we drank, and we totally hit it off. It was a love fest. I had such a good time, I forgot to step outside their shop and take a photo of it. Argh! But here's a link to the Google street view of their historic building, built about a century ago. I was tempted to swipe this set of four cheese plates and make a run for the door! I bought a couple of bars, of course. It is seriously delicious! I can't thank you enough, Erika and John, for making our trip to Ann Arbor and Tecumseh a memorable one. We'll be back sooner rather than later, I hope. There's still more of your cheeses to sample. And that award-winning restaurant next door we have to try! Hmmm, I foresee many trips to Ann Arbor in your future (just to be sure The Boy is fine, of course...). Thanks for a great tour! A-MAY-zing!! So much charm, beauty, enticements, and pleasures all in one spectacular place! A place I would love to visit, for sure! How wonderful to know you'll have future opportunities to visit, with more time to explore the area treaures. It is wonderful, also, to have such a detailed feel for my nephew's new environment -- looks very welcoming to me -- I'm sure he's going to have a great experience! I could never narrow it down to just one thing I love about ann arbor. But I can tell you that Spring is probably my favorite time to be here. Australia visa offer a specialist service for anyone wishing to travel to Australia for either tourism or business. When it's in the upper 60's to mid 70's and the tree's and flowers are all in bloom, the odor's are floating on the wind and everything seems so fresh and alive. It's like the whole world is being born again.